Springtime! Most of the snow in the high country has melted and has been moving downstream into the lower elevations and the desert. 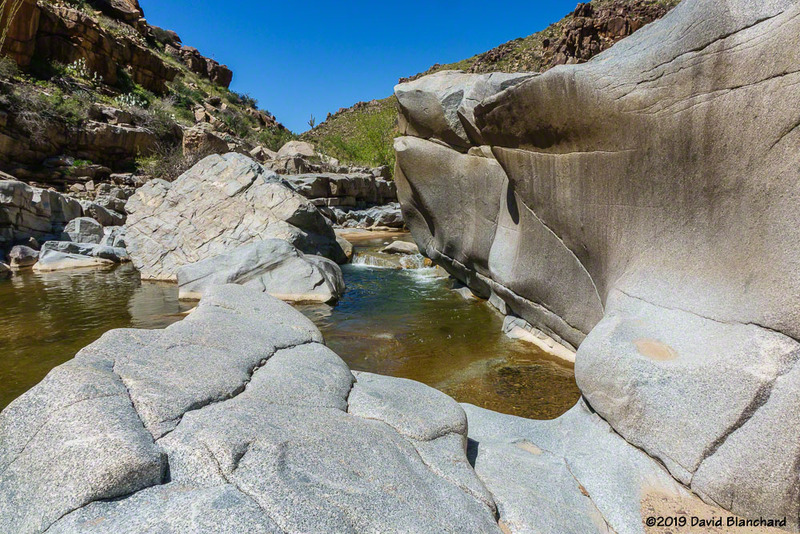 This means that many of the normally dry washes and low-flow streams now have abundant water in them. 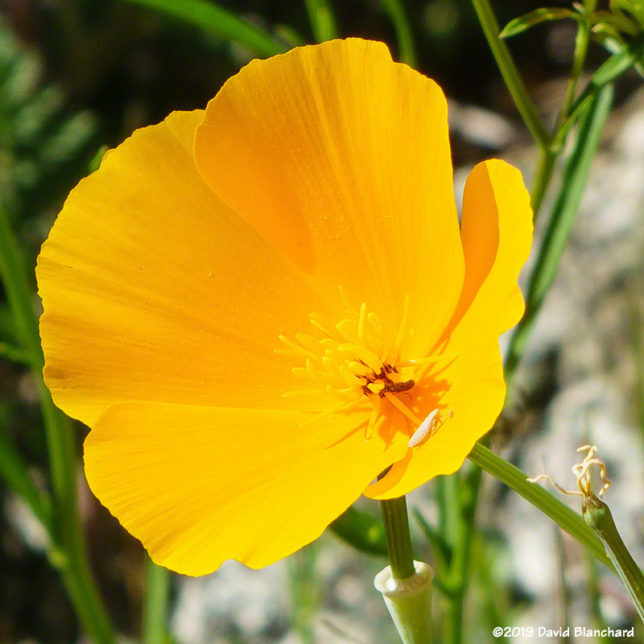 In addition, the bountiful precipitation this winter has allowed wildflowers to bloom and populate the desert. 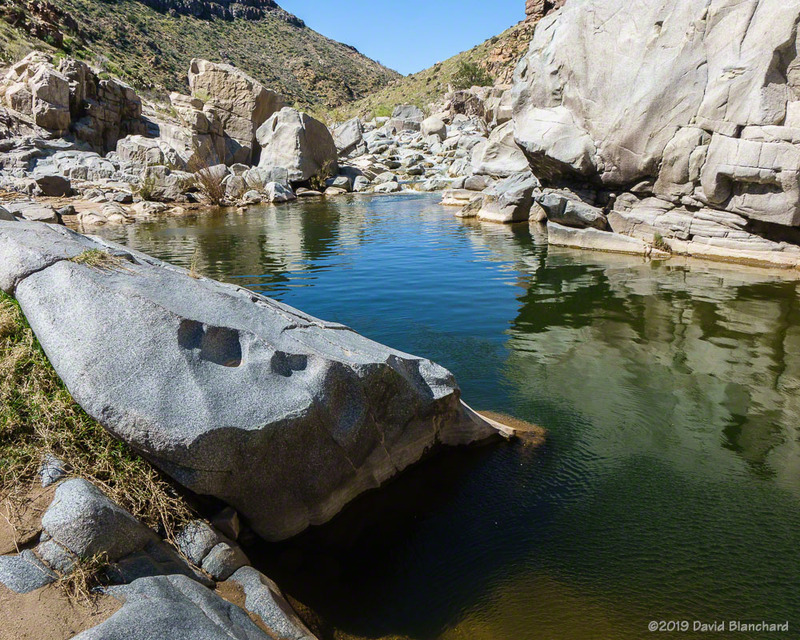 A deep pool in the Agua Fria River. We took a day hike down the Badger Springs Trail and then along a section of the Agua Fria River within the boundaries of the Agua Fria National Monument. The Agua Fria is a gem of a desert canyon. 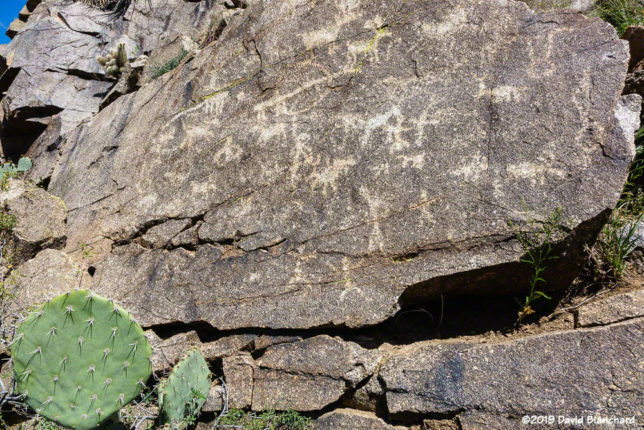 The bottom of this canyon is granite, sitting below rocky saguaro-studded slopes beneath a basalt rim. Proceeding downstream, you will be scrambling around, over, and under polished gray and white boulders that surround lovely pools. Petroglyphs along the Badger Springs Trail. 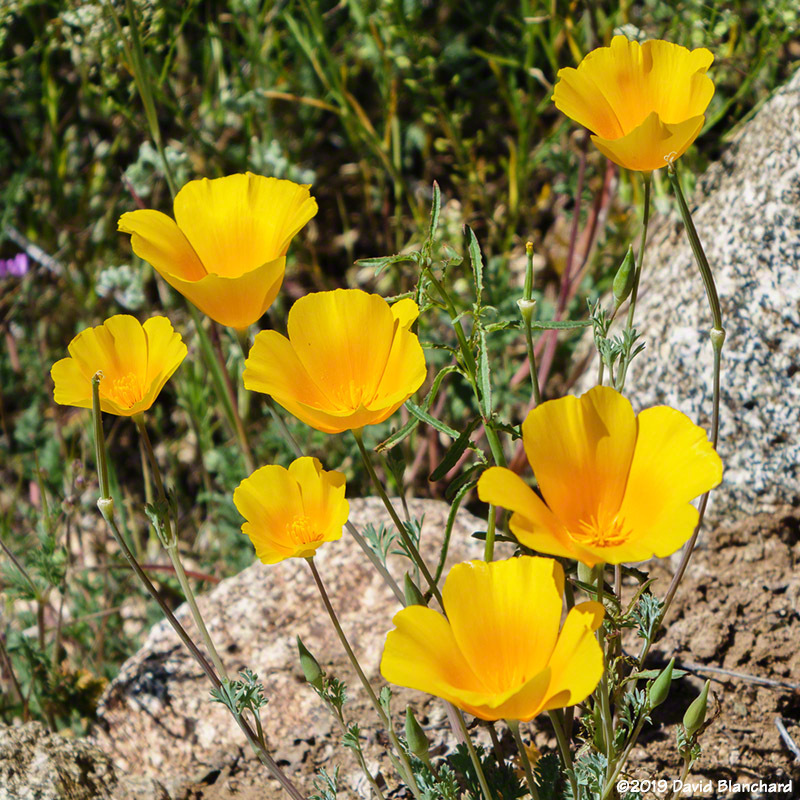 We were disappointed in the wildflowers as there were only small patches here and there rather than the full hillsides of flowers I was hoping to see. 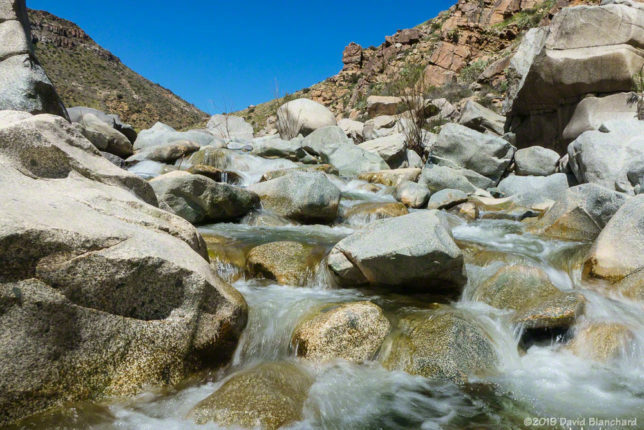 On the other hand, there was plenty of water in the river creating deep pools and small cascades as the water plunged over the numerous boulders. The water in the river was not particularly cold so crossing or standing in the water was pleasant. If the air temperatures had been just a bit warmer and without breezy winds we might have enjoyed jumping in for a springtime swim. Cascades on the Agua Fria River. 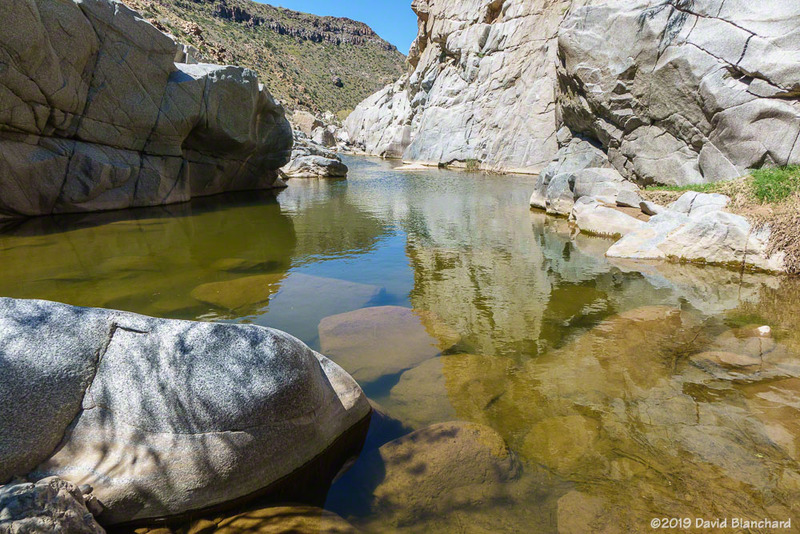 Deep pool on the Agua Fria River. Beautiful weather, easy hiking, lots of water, and wildflowers. Great day!